November 9th is dedicated to spreading hope and knowledge concerning a congenital birth defect, which derives its name from the Latin terms for little ears. The 9th has been chosen as the Awareness Day as we are to think of the number nine as the shape of an ear. 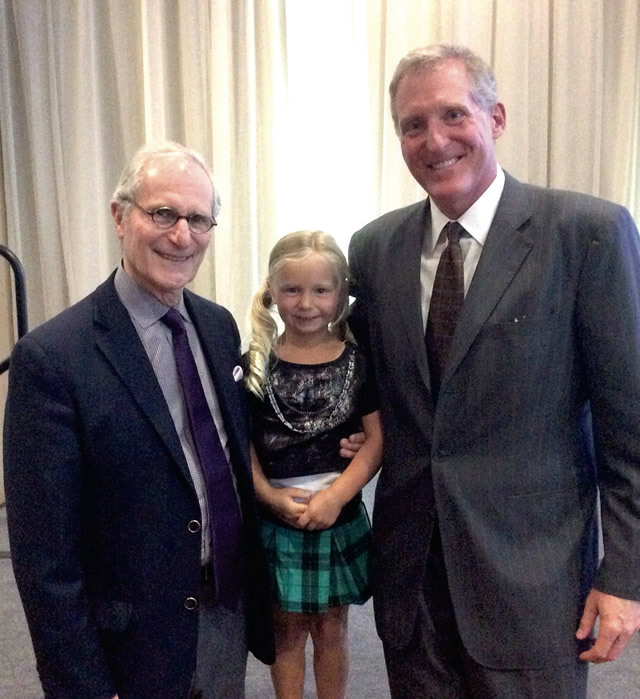 Willis stands with Dr. John Reinisch (left) and Dr. Joseph Roberson who performed the operation on her after being born with Microtia. Approximately one child in 9,000 is born with Microtia (when the ear(s) do not fully develop during the 1st trimester of pregnancy). It is diagnosed at birth, but there is no understanding as to why Microtia occurs. Facial challenges, hearing loss and the longing for social acceptance are some of the daily concerns for those who are born with Microtia. Often when answers aren’t forthcoming, hopes and dreams become overshadowed by unnecessary challenges to a joyous occasion. There are options and support! It is the intention of Microtia Awareness Day to help promote public awareness and the hope that future generations of families will leave the hospital armed with more answers than questions and their dreams for their child intact. Children are born into this world not knowing they are different from anyone else. Many with Microtia share similar stories of curious stares, bullying, or awkwardness. Individual personalities, social conditioning, available treatments and bullying all impact how every child develops and copes as an adult. By removing unnecessary boundaries and replacing them with resources, tools and support, we can eliminate bullying and clear the way for an even more successful future. With the advanced technology we can improve the lives of those with Microtia. From hearing aids and implants to surgical procedures and bio-ears that create new outer ears, all requiring research which in turn requires time, trials and support. The term “Microtia” was a foreign word with very little meaning to the Scott Willis family until March 17, 2009. Gracie Elizabeth Willis, daughter of Scott and Kari Willis, of Shelton, was born on this day and came into this world with just one ear. In place of her second ear were a couple of small nodules and no opening for a hearing canal. She spent the first week of her life in the intensive care unit (ICU) undergoing many tests to determine the full status of her birth condition. Under the direction of her family doctor and her pediatrician, Dr. Keifer, she soon became familiar with many specialists in Kearney and Omaha. Her parents were told that they would have to wait until she was five years of age before much more could be done. Since it is not that common there were no immediate answers as to how to proceed with Gracie’s lack of ear or hearing. Thus her parents were given the opportunity of time to begin their own research and discovery on what would be the best fit for Gracie. They soon discovered there were several options for them to choose, some involving multiple surgeries and some not. Through a college acquaintance, Kari was given the name of a doctor in California. She reached out to this doctor to only discover she was no longer going to be doing this particular kind of procedure. She in turn referred them to Dr. John Reinisch, developer of Medpor Ear Surgery for Microtia and leading pediatric plastic surgeon in this field, also from California. Scott and Kari reached out to Dr. Reinisch via email and phone calls. After months of exchanges, they felt that Dr. Reinisch and his procedure were going to be the right t for Gracie. From this point on all of their consults were done via Skyping. When Gracie reached the age of five, she and her parents traveled to California to begin the process of Gracie getting her ear. Gracie wanted pierced ears and sunglasses more than anything else, so she was excited to start the journey. They flew to Beverly Hills, Ca in the early morning, met with Dr. Reinisch and his team in the afternoon and on the second day were in surgery early in the morning where she underwent a nine-hour procedure that was considered “out-patient.” Once she was out of recovery she and her parents returned to their hotel where Gracie rested until the next day. In the afternoon she went to the Doctors’ office for an exam before she could be released to go home and the next morning they returned to Nebraska. Joining Dr. Reinisch in the surgery was Dr. Joseph Roberson from Palo Alto, CA. Dr. Roberson’s expertise was the ear canal and Gracie’s hearing loss. Addressing the aural atresia at an early age, children can have better hearing at the same time their peers are processing and learning language thus lowering the chance of developing speech disorders and difficulties with language. If the cosmetic aspects of microtia are addressed before they start school, it has proven children face less psychological distress. The Medpor structure that Dr. Reinisch uses is bonded with a patient’s own tissue, so it is typically very sturdy, thus the patients will be able to participate in the same sports and activities as their friends. Unfortunately for Gracie it was discovered that she did not have an ear canal or an ear drum. She was going to receive a Cochlear Implant. This is where Dr. Roberson came into play. During the nine-hour surgery he began by surgically placing a portion of the implant under the skin with a screw being drilled into the bone. The external portion of Gracie’s implant is an electronic device that magnetically attaches to the specific site. She can easily take it off, or put it on, as the situation warrants. Gracie received the first Cochlear Baha four implant System of this kind in the state of Nebraska. Which she refers to as her “Cochie”! So on November 9, the first National Microtia Awareness Day, Gracie’s family and friends will be celebrating Gracie and her journey by wearing t-shirts to honor her and to help increase the awareness for other families who may encounter similar obstacles. Gracie will be celebrating because she can hear better, wear fun earrings and funky sunglasses just like all of her friends. Download and Print Gracie's Story!